The minimalist EDGEsky Flat Glass Rooflight is the simplest way to add swathes of natural light to any room with a flat roof overhead. Its simple design enables roof apertures up to 1.2 x 2.5m wtihout any glazing bars, and its thermally efficient frame and high performance double glazing gives the rooflights market leading thermal properties. 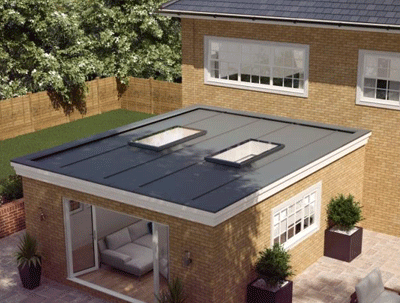 Why Choose an EDGEsky Flat Glass Rooflight? As you would expect from an EDGEsky product, the Flat Glass Rooflight combines high performance, with minimalist beauty and speedy, straight forward installation. COLOURS: The EDGEsky Flat Glass Rooflights are avilable in 3 standard colours inside and out: RAL7016m Matt Anthracite Grey | RAL9005m Matt Black | RAL9010 White You can choose any combination of these colours inside and out. Alternatively, we can powdercoat the trims to any standard RAL or BS colour of your choice. GLAZING OPTIONS: The EDGEsky flat glass rooflight incorporates a 28mm toughened double glazed unit made up of 2no 6mm thick skins. The inner skin is coated with a softcoat Low Emissivity coating (Low E) for increased thermal performance. The units are argin filled and have thermal spacer bars. The outer skin can be specified as eith standard clear or with Low Maintenance Neutral Solar Control Glass to reduce glare and heat build up. The glass has a centre pane u value of 1.0 w/m2k and the rooflight overall has a u value of 1.3 w/m2k. SIMPLE TO INSTALL: The flat glass rooflights can be installed either via direct fixing or by strap fixing. Whichever fixing otpion you choose, the fixings will not be visible once the aluminium trims are in place, ensuring excellent aesthetics and weather proofing. Internally, the rooflight incoprates a plasterboard pocket for easy boarding and plastering. Once internal decorating is complete, a finishing trim clips on over the plasterboard pocket to give the perfect finish. We recommend that EDGEsky Flat Glass Rooflights are installed at a 5 degree pitch onto a timber upstand that is 80mm thick all round. 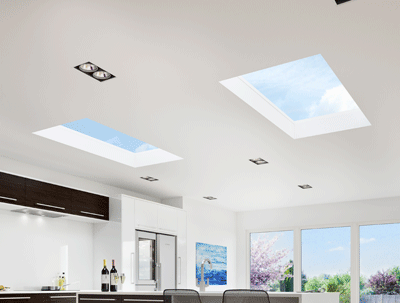 GUARANTEE: The EDGEsky Flat Glass Rooflights are guaranteed for 10 years (terms apply). STOCK SIZES: The EDGEsky Flat Glass Rooflights are available in a range of stock sizes on a shorter lead time, the sizes shown below are internal upstand sizes, based on a kerb 80mm thick and set to a pitch of 5 degrees. 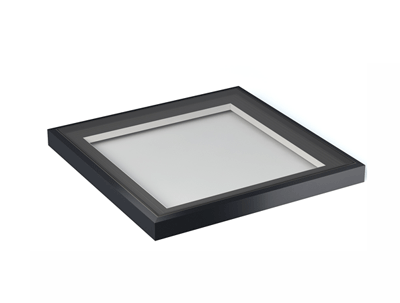 Stock sized rooflights include Solar Neutral Glazing and are avilable in the 3 standard colours RAL7016m Matt Anthracite Grey | RAL9005m Matt Black | RAL9010 White (internal trims can either be white, or matching the external colour). We can also supply the rooflights in bespoke sizes to suit your application. HOW TO ORDER: You can either browse the range of standard sized flat glass rooflights below or for a bespoke size, please download the quotation enquiry form and email it to sales@edgebp.co.uk, we will endavour to reply with 1 business day with a quotation.